I have written several Books on building the models shown on this website and sold over 80,000 copies, together with a thousand or so of the Portfolios of car plans and data photos from our own collection. The plans and data photos were drafted and collected from the actual cars to produce my own work. (I should point out at this stage that none of my books or Portfolios are now in print, but they are available from time to time on Amazon and eBay - so I am told). Many years back when I used to exhibit my work at the Model Engineering exhibition in London, on the Emco machine tool stand, I met many people who had copies of these books. When asked were they building anything from them, the answer almost always came back as ‘no’, but they intended to when they retired. I would now like to offer an after sales service to those who have used my books productively. Since having this website, particularly over the past few years, some of these people have now started to send me the odd photo or two of their models built from my original data and/or were inspired by the models shown in my books and here on the website. I have long thought that others might also like to see this excellent work, as further inspiration to take up the challenge themselves. I have been a professional model maker for over forty years, and as such would be expected to produce something of interest. The work shown in these photos, is created by people with next to no background in model making, and as far as I am informed (unless otherwise stated) none previous to reading my books in scratch building model cars, yet their creations are, in many cases, equal to the best. 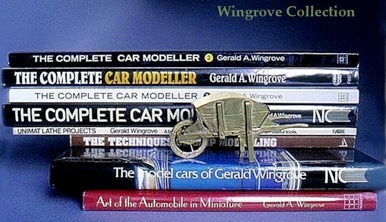 Several years back I had an e-mail from a budding model maker, looking to build a model car, who had purchased copies of all of my books, and wanted my advice on where to start. He had little experience and few tools. My advice was to look to make something simple, the subject did not matter, it was for him to get experience in using tools, to get the feel of things in his hands. Some time later he sent me a photo of his very first project, a perfectly made wheel barrow in brass. I was and still am exceedingly impressed. His name is Christian Taraud from Paris, France, and I am pleased to report that he has now progressed to more substantial things, Christian has recently started to scratch build a 1/15th scale 1928 B14 Citroen, from his own plans, drafted from data collected from a full size car, and extensive research material. The essence is to make a start on something to get the feeling, then progress to bigger things as the satisfaction increases, it is never as difficult as you think. My aim in making this space available for others to show their work, is not in any way to grade it, there is no order of precedence. The order that they are listed in the index, is the order in which they made contact with me and made their splendid photos available for me to put up here for you to see and enjoy. Should you have found inspiration, ideas, or just picked up new techniques from my books, plans, and/or web site, and have photos of your work built as a result, and would like to give me the honour of showing them to others here, please drop me a line, and I will let you know how to proceed. All of my BOOKS are now out of print, but they are available from time to time on Amazon. It gives me great pleasure and satisfaction to make this space available, and to know that in some small way I have assisted you in producing this work. Thank you for allowing me to show it here.